Linnaeus thought this species came from India, or the [East] Indies ("in Indiis"), a common mistake in his day, as the ship bringing this specimen probably came from the far East but stopped at African ports along the way, where African specimens could have been added to the cargo. 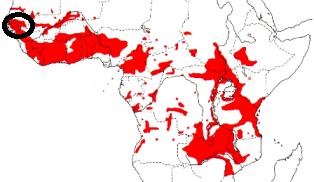 Gyldenstolpe (1924) first noticed the error, and restricted the type locality to Senegal as the type specimen matched other specimens from Senegal. Linnaeus noted the source of the type specimen as "mus ad fr", ie. the Museum Adolphi Friderici, a collection maintained by the King of Sweden, Adolf Fredrik. 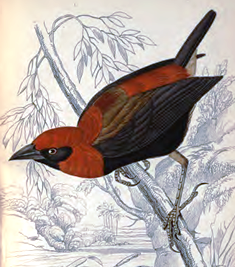 Swainson (1837) obtained described a specimen from Senegal as a new species (Crimson-crowned Weaver Euplectes flammiceps), but this was later discovered to be the same species as the Black-winged Bishop. Nevertheless, his painting is the first published illustration of this species, many decades after Linnaeus first described it. Loxia hordeacea	Linnaeus 1758a	Syst. Nat., ed. 10, p173	'in Indiis', errore = Senegal, vide Gyldenstolpe 1924.
hordeaceus (Latin) - of barley; referring to its diet. Unknown, but kept in the Museum Adolphi Friderici. 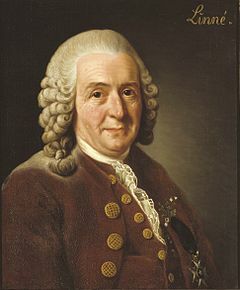 Before 1754, since Linnaeus studied the collection from 1751-1754. Unknown, type locality restricted to Senegal. The type is in the Swedish Museum of Natural History (Naturhistoriska riksmuseet) in Stockholm. Modern photos of the type are at here.